A few years ago at a disc golf tournament, we had the chance to play with a disc golfer who was deaf. After a few moments we realized there were actually a small handful of other deaf disc golfers playing. We talked to a few other locals and learned about the Deaf Disc Golf Association and the Deaf National Championship tournament. When we started All Things Disc Golf, the DDGA was something that we wanted to showcase at some point during the year. Thankfully, Kent Schafer reached out to us earlier this year on his own. Schafer is the tournament director of the 13th Deaf National Championship. This year’s tournament takes place this weekend in Springfield, Illinois. We talked with Schafer to get the details on the deaf disc golf community and this weekend’s tournament. All Things Disc Golf: Before we jump into this year’s tournament, let’s start with some background. The Deaf National Championship started in 2001. How did things get started and how big is the deaf disc golf community? Kent Schafer: In 2001, a couple of men in Austin, Texas boldly announced the “national championship” would be hosted in Texas. They advertised it via the Deaf grapevine, yahoogroups, and Deaf college students at Gallaudet University as well as Deaf students at Rochester Institute of Technology. Those two colleges were the largest deaf centered universities. I was in Colorado backpacking with a friend of mine, Kevin Harrer. We heard about this tournament and decided to carpool down and check it out. During the event, Kevin confirmed with his locals and announced that he would be hosting the 2nd Deaf National Championship at Frisco, Colorado. With the help of John Bird, Kevin made this a success. At the Colorado event, Dustin “DEW” Warren decided to bid for California and won. Thus began the bid process which eventually amped up to 3 years ahead to secure the bid. 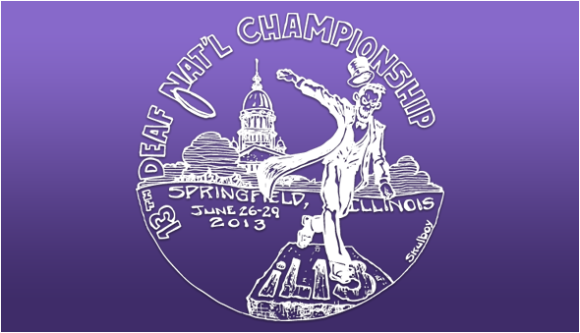 We are now going to bid for 2016 Deaf Nationals at IL13. The deaf disc golf community is huge. I consider it a grapevine. We were well connected before Facebook, before the Internet. There are about 3,000 deaf disc golfers out there. Perhaps 400-500 who play PDGA. It’s pretty easy to identify who’s the deaf guy. Now imagine we have limited access to another deaf people in our vicinity. We have to find events or locations to converge upon and make small talk. Disc Golf happens to be one of the most enjoyable recreational forms to get together and socialize. I often see these friends once a year at Deaf Nationals and catch up with life. All Things Disc Golf: We’ve had the chance to play in a few tournaments with deaf disc golfers. The camaraderie between the group was fun to watch, everyone wanted to know how each other were doing. What makes the deaf disc golf community such a tight knit group? All Things Disc Golf: How can someone get involved with the deaf disc golf community? Not just as a player, but as a volunteer as well. How can people show this group support? Kent Schafer: TD’s can try and put deaf disc golfers on the same card in the first round. Remember: follow the divisions. Rec with Rec, Int with Int. The fastest way to the community is to learn sign language. This takes patience and understanding. All too often we hear someone say “I wish I knew sign language” or “I want to learn” but rarely do they take the effort to actually learn and try to communicate. The most basic form of language is gestures. Think how “mimes” communicate without actual spoken words. This is a universal aspect of our language. French Sign Language (LSF) is not the same as American Sign Language (ASL) but we can try and communicate to each other if we understand gestures and basic concepts. All Things Disc Golf: How has the Deaf National Championship grown since 2001? Kent Schafer: Publicity, Recognition, More players. In 2001, We were looking at 40 players mostly from Texas. In 2013, We are looking to break the attendance record of 101 players, which coincidentally was hosted in 2009 at the same location – Springfield, Illinois. We have bigger payouts, more competition, and still the desire to give the Texas deaf disc golfers some beatdowns. Locals from Austin, Texas has 7 out of the 12 national championships so far. Gas money has not stopped us from carpooling and getting together for a week in disc golf paradise. The first few years were difficult as we were in a bubble. Finally around 2008, the bubble burst. We have gotten monetary endowment sponsorships from David Feldberg and Ken Climo. We have been able to get booths out to several PDGA events to gain recognition.Deaf disc golfers are now getting some sponsorships. Most notably DGA being the first disc golf company to sponsor a Deaf Disc Golfer. Gorilla-Boy, Paragon, and Iron Lion are some other companies that sponsor a deaf disc golfer. All Things Disc Golf: Looking at the pre-registration list, you have golfers coming from all over the country coming for the tournament. What’s it like to see everyone converge on Springfield for the tournament? Kent Schafer: In one word – Awesome. I have been out of the loop for the past 3 years as I enrolled in Summer school so I could get my second master’s degree and some job security. I look forward to 3 years worth of catching up with over 75% of these players!! All Things Disc Golf: Is there a players pack for the competitors? Kent Schafer: Every player, every division will earn a players pack. We have special treats for our women deaf disc golfers and even the pro deaf disc golfers. All Things Disc Golf: Who make it possible to put on the 2013 Deaf National Championship? Kent Schafer: David Tomlinson, Springfield Deaf Disc Golf Club, Box4Discs, Paragon, Nichola Landry, Anthony Strong and his church., Soul Flight, Dynamic Discs, DGA, TalkDG, Gorilla Boy, WA12 committee, James Clark, Chain Reaction, Skulboy, Disc-Lexia, Waterloo, Corey and Carrie Driscoll – the VT10 crew, WTF – women throwing frisbee, PDGA, Fly High Disc Golf, Tom Osborne, James Forgy Jr, Kent, Brean, Alanah, Madison Schafer, MNDDGA (Minnesota deaf dg), Spartanburg DDGC (South Carolina deaf dg), DDGA, FarDogs Allstar Team, Colonial Springs – O.G.erow, The Dow family, Bearded Brothers, Deaf Island (martha vineyard), Beaver State Fling, Scott Kendziorski and the Silent Chainbiters, Flying Hands DGCD (indiana deaf dg), Michael Gay, Representing the NW – WDDGA and ODDGA, PDGA 39436 and DDGA 179, MonsterHouse, ADDGA (austin deaf dg), Las Vegas Disc Golf Club, Gerardo DiPietro, Hilton Hotel, Dana Vicich, Jim Trotter. There are more still coming in. All Things Disc Golf: Anything else you want to cover? Kent Schafer: Want to give a shout out to DGA – without them, the 13th Deaf National Championship wouldn’t have even been possible!